Can invitations be sent without an email address? No. The invitation process in TeamSnap works on an invitation basis using email addresses. An email address is required in order to set up an account. 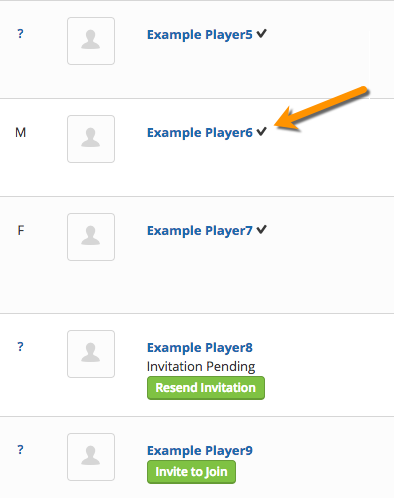 When adding or editing a player, if the checkbox for Send Invitation was selected, the invitation was sent automatically once you clicked Save. If you deselected the checkbox for Send Invitation, then the invitation was not sent out. You can confirm this by checking whether the player's name shows a checkmark next to it in the roster list. If so, it means that the invitation has been sent and accepted. If there is a Resend Invitation button, this means that the invitation has been sent but not yet accepted, and if there is an Invite to Join button, the invitation has not been sent out yet. Learn more about the ins and outs of Resending an Invitation. How can I tell who has access? When you view the roster from the roster tab online, you will see a checkmark by the player's name. 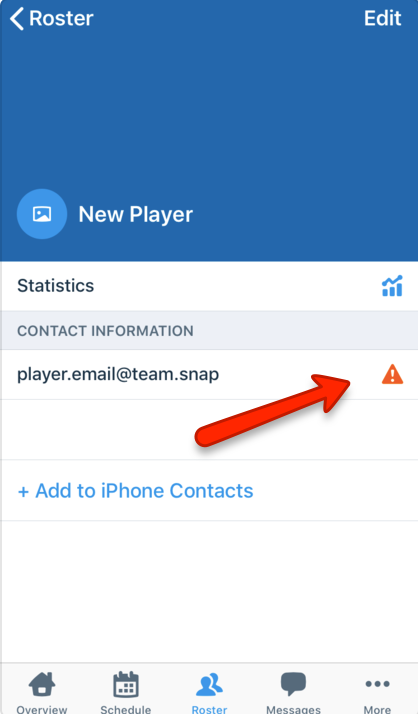 To view player contacts and see which contact invitations are still pending, click the player's name. You can see below that the Mother Example contact has not accepted their invitation. If an invitee has expressed that they cannot locate their invitation, you can resend it by clicking the Resend Invite button. Invitees who aren't able to locate their email invitation may also need to troubleshoot email issues. A small orange triangle will appear next to the email address for members that have a pending invitation or have not yet been invited to the team. Managers can resent the invite from the mobile app by editing and re-saving the player's profile.